History on Film/Film on History has established itself as a classic treatise on the historical film and its role in bringing the past to life. In the third edition of this widely acclaimed text, Robert A. Rosenstone argues that to leave history films out of the discussion of the meaning of the past is to ignore a major means of understanding historical events. This book examines what history films convey about the past and how they convey it, demonstrating the need to learn how to read and understand this new visual world and integrating detailed analysis of films such as Schindler’s List, Glory, October, and Reds. Advocating for the dramatic feature as a legitimate way of doing history, this edition includes a new introduction, a revised final chapter, a new epilogue that discusses recent history films such as Selma and The Imitation Game, and an extensive and updated guide to further reading. Robert A. Rosenstone is Professor Emeritus of History at the California Institute of Technology, USA. His award-winning biography of John Reed, Romantic Revolutionary (1975), was used as the basis of Warren Beatty's multiple Academy Award winner, Reds, on which Rosenstone served as historical consultant. His other publications include Visions of the Past: The Challenge of Film to Our Idea of History (1995) Crusade of the Left: The Lincoln Battalion in the Spanish Civil War (1969), and Mirror in the Shrine: American Encounters with Japan (1988). He is the editor of Revisioning History: Film and the Construction of a New Past (1995) and Experiments in Rethinking History (2004) and is the Founding Editor of Rethinking History: The Journal of Theory and Practice. 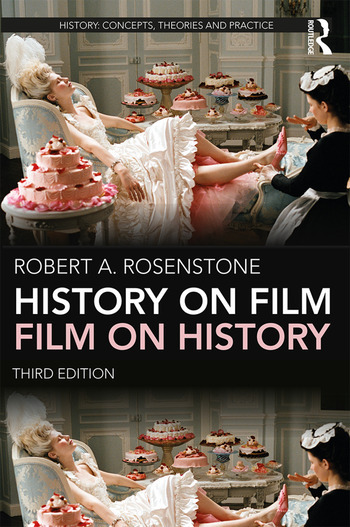 "Robert Rosenstone’s History on Film/Film on History in its third edition remains one of the few concise and comprehensible academic texts for use on the university level in courses that have history on film content. Rosenstone has been and continues to be a critical definer of this key interdisciplinary arena. As an introduction to history on film/film on history, this text remains essentially relevant and inimitably accessible." "This is best book on film insofar as it makes historians re-evaluate the validity of history on film… It is accessible and it is intelligent."